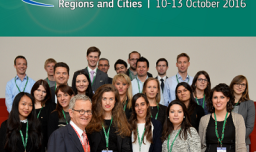 European Week of Regions and Cities 2016 Master Class: 30 researchers and PhD students wanted! The European Week of Regions and Cities 2016 Master Class, organised by DG REGIO, Committee of the Regions, Regional Studies Association, ERSA and AESOP will start 9 October 2016 in Brussels. The call for applications is now open and the deadline for their submission is 9 May. This prestigious event will bring together 30 selected early career researchers and PhD students to present and discuss recent research on EU Cohesion Policy and regional/urban development with EU officials and renowned academics. – Promoting inclusive growth and social cohesion, including the territorial dimension and the integration of urban and rural development. – The significance of the network economy: policy learning; transfers between regions and cities; knowledge spillovers. – Improving the Cohesion policy delivery system: performance, simplification and accountability.